A sleek, narrow, 24-foot-tall (7.3-meter) vessel, the DEEPSEA CHALLENGER has three main sections. The beam, the biggest single component, is made of a new kind of foam that provides both flotation and a strong structural core. The pilot sphere is slung below the beam, and below that an array of scientific gear stands ready to deploy at the bottom. While submersibles are traditionally designed along a horizontal axis, the 11.8-ton DEEPSEA CHALLENGER is one of a kind—it slips rapidly through the water vertically. About 70 percent of the sub’s volume is taken up by syntactic foam. Formed of millions of hollow glass microspheres suspended in an epoxy resin, syntactic foam is the only flotation material that can stand up to the incredible pressures in the deep ocean. But when the engineers behind the DEEPSEA CHALLENGER tested the two “full-ocean-depth-rated” foams that were on the market, they proved not to be adequate. In fact they cracked, warped, and compressed, losing buoyancy, and did not have nearly the tensile strength required for the new vehicle to operate under extreme conditions. This was a serious setback to the project. But lead engineer Ron Allum then spent 18 months designing a new type of syntactic foam, which has since been dubbed ISOFLOAT™ and patented. The foam provided the buoyancy James Cameron needed 7 miles (11 kilometers) down, without crushing or warping, and has twice the tensile strength of previous foams, allowing it to be used as the main structural frame of the sub. Once on the bottom, the lone pilot can use joysticks to command 12 thrusters to propel the sub along the ocean floor. The thrusters will allow him to move forward at 3 knots, as well as vertically at 2.5 knots—and it turns out, from sea trials testing, that the sub is quite responsive and nimble despite its mass. It can turn on a dime and maneuver quietly adjacent to free-swimming animals near the bottom, imaging them on its 3-D cameras. As with almost everything else on the DEEPSEA CHALLENGER, full-ocean-depth thrusters were not an off-the-shelf item. It took a year to design the fluid compensated electronics and to hand build each thruster at the sub’s shop in Sydney. Throughout the DEEPSEA CHALLENGER, more than 180 systems are monitored and controlled, including batteries, thrusters, life support, 3-D cameras, and LED lighting. One system constantly monitors the sub’s battery power and oxygen levels and reports the results to the pilot on a color touch-screen display. Another system reads the pilot’s joysticks and in turn controls the thrusters that propel and position the sub, as well as the mechanical arm. At the push of a button, the control system can keep the sub at a set level above the seafloor. This is called Auto Altitude. Another function is just like the cruise control on a car: The pilot pushes the “cruise” button when he has set his forward speed, and the sub stays at that speed for as long as required. The DEEPSEA CHALLENGER‘s pilot is alone, but can spend a lot of the journey talking: He can narrate a “dive log” to two small cameras (two are needed to create 3-D video) inside the sphere. He can also talk to the surface through several systems—one with a 19-mile (30-kilometer) range underwater. When necessary, he can send text messages, which are more efficient than voice communications. The submersible’s mother ship, on the DEEPSEA CHALLENGE expedition, the Mermaid Sapphire, and the 30-foot (9-meter) rigid-hulled inflatable Prime RHIB were each equipped with two transducers—one on board and another suspended on a cable about 330 feet (100 meters) below the water. The sub also has a backup acoustic modem/transponder powered separately from the sub’s main battery. Once the sub surfaces, it uses a VHF marine radio to communicate with the crew. If there’s a power failure or the magnets’ batteries run out, the weights will drop automatically. The support team at the surface can command the weights to drop via an acoustic command. 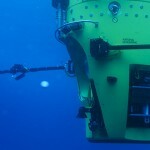 A special wire (galvanic timed release) helps connect the weights to the sub; it will corrode after about 11 to 13 hours in seawater. The pilot can power up something called a “frangibolt,” which uses heat to break the bolts that keep the weight-drop mechanism in place, thus jettisoning the whole assembly. The sub has two “booms,” essentially long metal poles that the pilot can move from inside the sphere using hydraulics. One positions a powerful spotlight, the other a 3-D camera. More light is provided by a seven-foot (two-meter) panel of LED lights mounted on the sub’s front face. 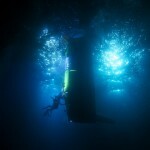 In very clear water, the panel can illuminate up to 100 feet (30 meters). More lights, including a strobe, are installed on the top, so the recovery team can find the sub if it surfaces at night. The pilots will rely entirely on battery power during their dives. In fact, the sub has enough batteries to power two or three modern electric cars. Most of the stored energy is contained in about 70 bread-loaf-size battery packs inside oil-filled plastic boxes mounted into the sub’s sides. The number of batteries needed depends on the needs of the particular dive, and they can easily be traded out. There are three main buses of batteries—the sub can lose two and still function. The batteries are also spaced just far enough apart that they won’t be disrupted when the foam structure that they sit in shrinks by about 1 percent under the ocean’s pressure. Each battery is housed within a plastic case immersed in a bath of silicon oil, enabling the electronics to be exposed to high water pressure without coming in direct contact with seawater. This avoids having to build heavy, pressure-resistant housings to keep the batteries dry. But even the silicon fluid can shrink under the pressure, so engineers came up with one more trick to keep the pressure around the batteries just right. The plastic case around each battery pack includes a small opening that leads to a plastic bag, essentially a bladder, inside the pack. When the pressure increases, the bladder, which is actually made from a medical drip bag, inflates with seawater without letting any water touch the battery itself. The seawater is expelled just as easily as the sub ascends to the surface. This approach to creating fluid compensators for oil-filled systems is unique to this new submersible. The DEEPSEA CHALLENGER has several locating systems to assist the recovery team in finding it after it returns to the surface. The acoustic navigation system allows the ship to track and plot the submersible as it rises through the water column, so that the support vessels and divers are in ready attendance (at a safe standoff distance) as it surfaces. If this fails, a fully redundant pair of LED beacon lights are visible at night for many miles. These lights run on a dedicated battery system, separate from the sub’s main power, and can last for up to 16 hours after return to the surface. There is also a strobe light that can flash for 30 hours. The sub has two separate GPS beacons in separate glass, pressure-resistant spheres. One uses a satellite system to send the sub’s coordinates to the ship’s bridge at any range from the ship. The other uses marine VHF to broadcast the sub’s coordinates at ranges limited by line of sight (6 miles, or 10 kilometers, for the ship, and up to 50 miles, or 80 kilometers, for aircraft). There is also a Radio Direction Finder system.